We have two pear trees in our back yard. One produced a really good, sweet, tender pear this year. This one we ate by itself. The other pear tree, produced 4 smaller, harder pears. These did not seem quite edible by themselves as they were very firm. We had to pick them as they were getting red/green and actually starting to fall off the tree. But what to make with them? We originally were looking for a baking recipe, but then opted for this one. This seemed like it was a better choice for the firmer pears as they were cut up. If we were to do it over again, we would actually cut it into smaller pieces so they would cook faster. The cooking time on the recipe says 35 minutes, but we probably cooked it for more than an hour until the firm pears were completely softened. With that being said, this was absolutely delicious over vanilla ice cream. We did not have any raisins, but had some dried cherries and those worked great as a substitute! 1. Combine all ingredients in a small sauce pan and bring to a boil. 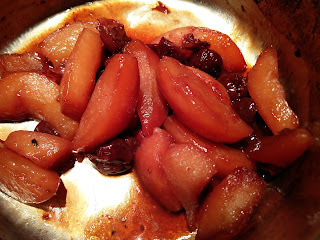 Cover and cook until the pears are softened and a thick syrup is formed from the liquid. 2. 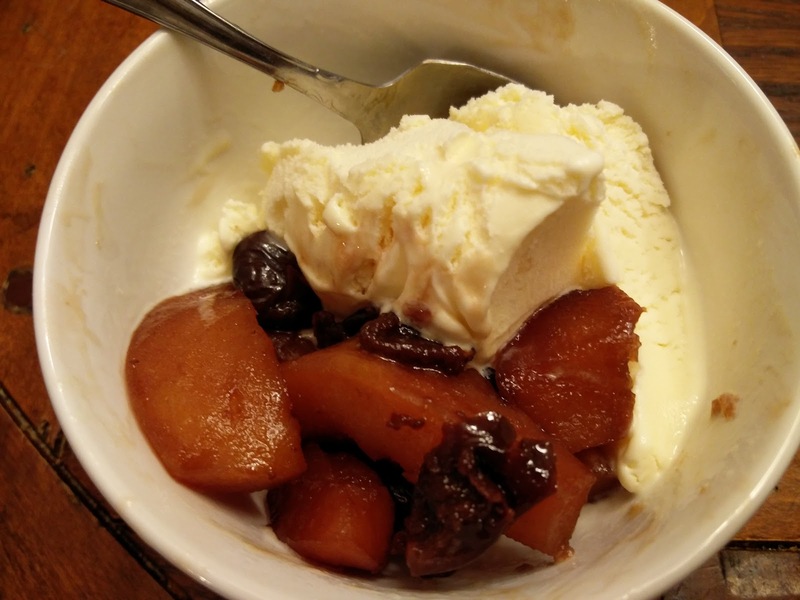 Serve warm over vanilla ice cream. This was a great use of our pears! It was delicious, though took longer to cook than anticipated. It took a long time - most likely due to the firmness of our pears though. It did not catch his fancy.... after all, there is no chocolate! A more ripe pear selection would create a faster dessert.